Benjamin Cluff Jr. was the first president of Brigham Young University. He was a member of The Church of Jesus Christ of Latter-day Saints. 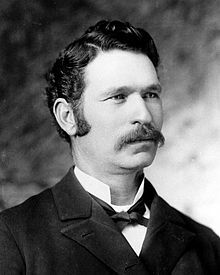 Cluff was born on February 7, 1858, in Provo, Utah. He lived in Coalville, Utah, until he began his studies at Brigham Young Academy. After one year he taught at the academy until he left to serve a full-time mission to Hawaii. When he returned in 1882, he continued his teaching at the academy. In 1886 he was granted a leave of absence to study at the University of Michigan and was set apart for this endeavor by John W. Taylor. He returned to the academy and served as Karl G. Maeser’s assistant principal. A year after he obtained his bachelor’s degree, he was appointed principal of Brigham Young Academy (1892). Until that time, the academy had functioned more like a present-day high school and older students taught younger students who were at an elementary level. Cluff began to separate the college from the high school, he lengthened class periods from 30 minutes to one hour, he added courses and increased reading and writing requirements. He also introduced athletics. He believed it was time for the school to be incorporated by the Church. Although this same suggestion had been made and rejected a number of times in the past, on July 18,1896, the board of trustees incorporated the school. Cluff organized an expedition to explore Mexico in search of the Book of Mormon city Zarahemla. Heber J. Grant, who was then serving as member of the Quorum of the Twelve Apostles stopped him on his journey and told him to quit the venture, but Cluff went ahead. While on the journey he had married a third wife with permission from Joseph F. Smith. He returned to the academy in 1904, but was forced to resign as he faced accusations of various improprieties during the trip. Before he left his post, he asked the board of trustees to rename the academy Brigham Young University. The decision passed after much opposition and discussion. For the rest of his career, he spent many years in Mexico running a business. He died on June 16, 1948, in California. This page was last edited on 1 September 2016, at 16:17.